The main objective of the life sciences and medical industry is to save lives. Therefore, companies rely on clear communication to ensure their success and patient security, especially for the translation of doctor and pharmaceutical manuals, clinical trials, medical devices, patient records, leaflets, medical reports, instructions, and prescription information. These materials really help healthcare companies provide world-class information. 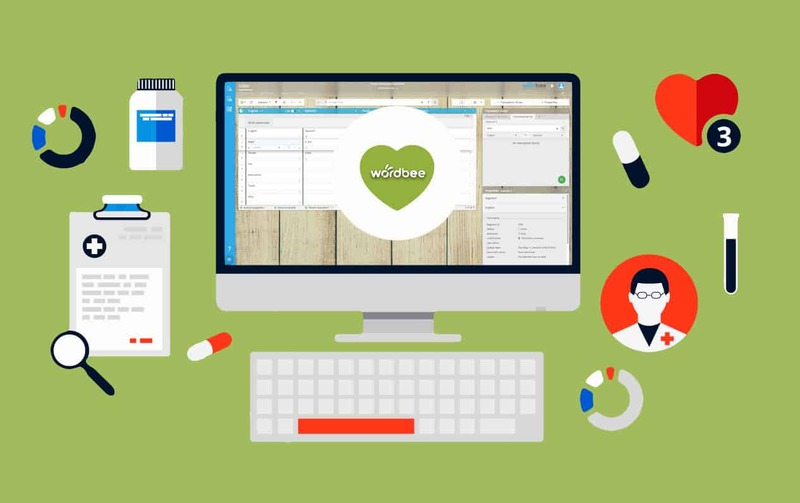 Wordbee provides an all-in-one experience for pharmaceutical, healthcare, and medical device companies to run their localization processes cleverly and improve time to market, efficient operations, and worldwide regulatory compliance. Every new medicine needs to go through a clinical trial, Patient Reported Outcomes (PRO) need be analyzed, and the medicine must be deemed safe for humans to consume and doctors to prescribe. Failure to comply within ethical and specified guidelines could result in catastrophic results, such as serious health risks or patient fatality. So what does Wordbee bring to the table to prevent those issues? Remarkable management: Reliable workflow processes specifically tailored for life sciences, like back translation and other custom, exotic workflows with multiple QA steps and stakeholders. Automation: Workflow handoffs set up workflow templates for translation, proofreading, revision, or other phases, and Wordbee hands the jobs off for you! Rock-solid quality assurance: Spellchecker, concordance, formatting, translation memory matches, and a total of 20 quality assurance checks for your translators and managers. Medical device companies nowadays have the ability to access worldwide markets easily and take full advantage of globalization. But, before medical devices are approved and green-lit, they need to pass strict registration tests and comply with newly drafted regulation. Therefore, the documentation must meet strict language and translation criteria enforced by international governments before medical devices enter a new market. In-market, in-context: Translation documents can all be translated and reviewed by the Wordbee Editor. Time-to-market and costs are considerably reduced by performing the in-context editing online and increasing quality. MT integration: Connect Wordbee with the most powerful machine translation (MT) engines such as Google Translate, Bing, DeepL, Reverso and Lingua Custodia. Take advantage of complete automatic translation workflow without any human intervention. Reduce business risks: Wordbee can help you reduce business risks by using reliable translation workflows and easy replacements. Wordbee also gives you the advantage to keep all your documentation translation knowledge in one centralized, secured system. In recent years there has been a trend toward global consolidation within pharmaceutical companies, meaning that more and more acquisitions and mergers amongst various companies have taken place, resulting in a significant increase in demand for high-quality pharmaceutical translations. Pharmaceutical companies need to provide high-quality translated materials, such as package labels and information leaflets to their customers to market their products in foreign countries. How can Wordbee help with this process? Global search: Locate information between multiple resources within Wordbee Translator and quickly find and replace a word or segment within different translation projects or resources. Live preview: Our live preview is actually a live preview of the software interface. It does single-page apps, drop-down menus, modal windows… anything in your application. Dynamic software loc: What you do in one language may or may not go into all the others. Wordbee handles your hodge-podge of language combinations, files, and file versions, all within a single project. If you want to find out more about how Wordbee meets dynamic translation requests for all life sciences and healthcare sectors, please check our documentation for more in-depth features. Want to learn more about life sciences localization? Watch the recording of our experts panel discussion on our YouTube channel.